Artists have long used approaches like elaborate and surreal narratives and phenomenological or physical experiences to explore the breadth of reality. At its most basic level, reality is a physical or social interaction with a string of consequences that extends beyond oneself. Artists, philosophers, scientists, and technologists continue to unravel reality as a complicated matrix of self and perception. The emerging technology of augmented reality (AR) creates hybridized spaces that merge virtual objects and narratives with the everyday space we inhabit. As AR develops solutions for the many real-world issues it faces (like application, ownership, access, adoption, and format), these issues affect AR’s artistic and political potential. Using smartphones,1 AR participants scan a Quick Response (QR) code or AR symbol to interact with virtual objects that appear superimposed on the everyday world through their phone’s screen. Unlike two-dimensional images, AR objects are vector-based renderings with X,Y, and Z axes—the same type of data used in 3D printing. Moreover, artists and designers assign global positioning satellite (GPS) coordinates to their objects, placing them in a meta-space that overlaps the tangible space users occupy. Users’ phones coordinate their GPS location with that of the AR object; as participants move through space, the virtual images on their smartphones shift in perspective. As its name suggests, AR attempts to augment, which on a rhetorical level is an improvement made through addition. In contrast, its technological cousin virtual reality (VR) attempts to simulate, which allows designers and artists unlimited freedom to create the context for their narrative or experience. While apps like Layar2 suggest that AR is an additional level placed upon reality, it is actually a hybrid space that merges users’ real, physical embodied location with the virtual and visual experience. 4Gentlemen. The Goddess of Democracy (contextual image), (2011–present); augmented reality artwork. Courtesy of the Artist. Subsequent to the 1989 Tiananmen uprising, when the People’s Liberation Army violently thwarted protestors, Chinese government censors have attempted to eliminate references to the uprising on the internet and mass media.5 In response, the exiled and anonymous collective 4Gentlemen6 created 3D models of the Goddess of Democracy—like the one erected by students at the Central Academy of Fine Arts during the demonstration—and “Tank Man,” the anonymous figure who stood against a plethora of tanks on Chang’an Avenue. Photographs of the Goddess of Democracy and “Tank Man” are widely circulated around the world and have become iconic images of individual bravery and military authority. 4Gentlemen have placed their AR objects at the GPS locations of the Tiananmen Square protests. Additionally, Google Maps indicates that the AR Goddess of Democracy has been placed at international squares of public protest, like Green Square, Tripoli, Libya; Al Tahrir Square, Cairo, Egypt; Tahrir Square, Sana’a, Yemen; Pearl Square, Al Manama, Bahrain; Union Square, NY; and Piazzo San Marco, Venice, Italy, to name a few.7 Although erecting physical monuments of protest is challenging in repressive regimes, thus far these AR objects seem to be able to resist censorship. Unlike physical monuments, these AR monuments are easily replicated and moved, and can linger long after protests have occurred. 4Gentlemen. 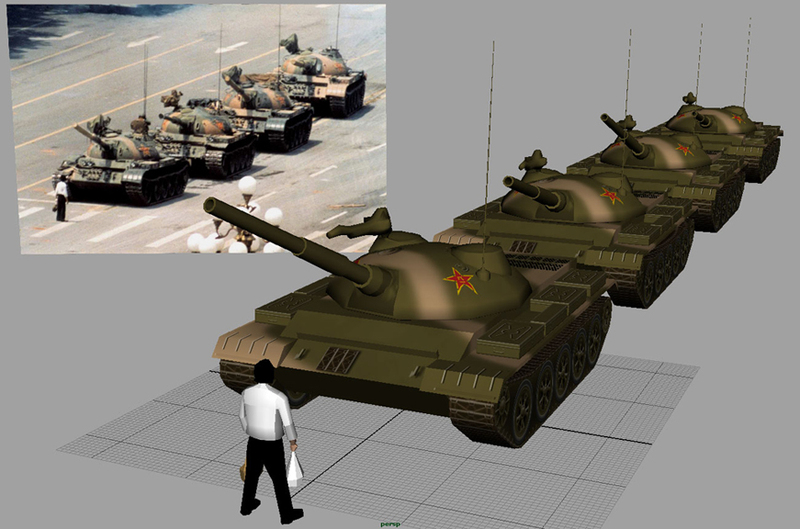 The Tank Man (contextual image), (2011–present); augmented reality artwork. Courtesy of the Artist. While GPS allows artists and designers to create politically challenging works about specific locations, its physical requirements are also potential barriers to users. With AR objects tied to GPS coordinates, participants need to occupy the same location to experience the work. Because I was unable to go to any of the specific locations in Chicago and China, I did not directly experience any of the pieces in this essay. Art writing is frequently researched through and complemented with photographic or video documentation, whether because the works are not easily available, no longer exist because they were ephemeral in nature or destroyed, or have restricted access because of conservation or ownership issues. With works that demand or transform physical or social relationships, it is difficult to develop an understanding of a work’s artistic and political potential without physically experiencing it. Additionally, in politically sensitive locations where users are concerned about government surveillance, individuals may be reticent to participate for fear of being recorded, given the ubiquity of video cameras and smartphones. Though Chinese artist and dissident Ai Weiwei has famously turned his camera back on the government’s surveillance of his own life, it may be too much to ask ordinary citizens to take the same risks. In Life on the Screen (1995), psychologist and sociologist Sherry Turkle provides many examples of the therapeutic and deleterious aspects of role-playing—be it Live Action Role Playing (LARP) or virtual games. The ability to segregate/apply pure fantasy from/to real life seems rather specific to the individual and context. We have yet to see if hybridized space, with one foot in reality and one in the digital space, affects users’ abilities to transfer political and social ideas beyond the realm of fantasy. While currently AR’s rather crude and artificial appearance may interfere with users’ ability to leap between AR and everyday life, its mimetic capacity will only improve over time. When faced with similar technological obstacles, the simplified graphics and robotic movement of early interactive games, like Second Life, did not deter some users from being fully immersed in the imaginative narratives; some users even became dependent on the worlds. Turkle suggests that despite an absence of believability, both logically and visually, in early technologies—like artificial-intelligence (AI) robots, computer simulations like ELIZA, and interactive games—individuals project their personal or psychological desires onto things, machines, and images to construct a narrative and connection. As AR’s graphic capabilities continue to develop, the ability for users to make psychological, political, and social transferences between screen time and real time will improve. With fundamental questions about the platform and its use, adoption, and so on still to be determined, AR poses a potential political and economic battle for the everyday space we inhabit. As billboards sprung up along the once ill-defined spaces of the interstates, these routes became commodifiable. Additionally, the internet, the so-called “super highway,” has become dotted with banner ads as commercial interests compete for our attention. Our everyday space, like when walking down the street, may also become a contested zone, as every physical point is a GPS location with the potential for being a pop-up ad or a location for governmental censorship or surveillance. You are currently reading Augmented Reality: The Political Potential of Hybridized Space – By Genevieve Quick at .